I am the best! …..Well, actually, Christian Guidice is. I am the sexiest, coolest, most colorful and incredibly awesome of all boxing writers, but my friend Guidice is the best. As far as writing talent, I, along with Max Kellerman, Jeff Ryan and the rest are leagues below Guidice. 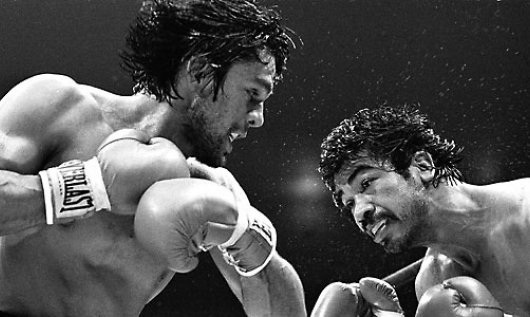 Guidice is the guy that brought us Beloved Warrior, the story of great Nicaraguan, Alexis Arguello. Hopefully, and I keep asking him this, we will next bring us the story of Puerto Rican Wilfredo Gomez or Wilfred Benitez, but for now, he brings us Hands Of Stone: The Life And Legend of Roberto Duran, (2009, ISBN-10: 190385475X, ISBN-13: 978-1903854754, Milo Books, www.milobooks.com, www.christianguidice.com, all rights reserved) which is, like always, another great book by Guidice. Hands Of Stone is much more than just a fight by fight account of the career of who is arguably one of the top ten fighters of all times, many times ranked as high as third, behind only Ali and Robinson. It is a trip through Panama, an investigation into Duran’s life, how he came to be who he is, his family, dad Margarito and mom Clara (coincidentally, Clara was also the name of the mother of one of Duran’s ring rivals, Wilfred Benitez), wife Felicidad, manager Carlos Eleta, and many, many more things. Guidice is very precise in details; he retakes us through yesterday’s Panama, in which there was a government strongman who was as distant to his fellow citizens as Duran was close to them. He reminds us of the Panama Invasion choreographed by, among others, President Bush (the first! ), a moment in which Latin America wondered where its future lay. Guidice has distinguished himself for being a writer who writes about what all we boxing fans care: the deals, the training and the fights inside the ring. But he also writes about what all we boxing fans should care about: the lives, situations and historical elements outside of the ring. I did not know, for example, about Chaflan, about Plomo, about Toto, or the other figures Duran knew and cared about. Now that I do, I’m not kidding you, I actually want to know more about them. And….did I mention that the book is base to a film that will be released in 2014? I cannot await for it to hit theaters in the USA, and I will be the first one with a ticket to the movie. All thanks to the book. Gabriel Garcia Bernal was rumored to be the actor playing Duran, and to tell you the truth, I wanted it to be him since he is one of the most consummate actors of my race, the Latin race, but the job apparently landed on Edgar Ramirez’s lap. Robert DeNiro will play Ray Arcel and Usher will play Sugar Ray Leonard. You really cannot ask for more when it comes down to acting talent! Hands Of Stone is really a small, coffee-table book, but its content makes it a gigantic book also, kind of like Gomez, Julio Cesar Chavez Sr., Mike Tyson or Duran himself, a small package with a lot of power! Both men and women will enjoy this book because it examines Duran the person, and it will make you laugh and at the same time also, feel sad and hopeful for the man who once supposedly knocked out a horse. I guess that if you are Maria Celeste Arraras reading this and you just read that last statement I just made, you probably won’t get the book, but if you are not (and I suspect that maybe you aren’t her) then I guarantee you a fun read that is hard to keep down. And for a price suggested at less than $10.00 dollars, why would you want to keep it down?? Get the bargain while you can!!! Christian Guidice once again turned in a labor of love, and we boxing scribes, should learn from him!